The moment you step through the front door of this luxurious custom home, you're welcomed with stunning views of Lake Tellico and the Smoky Mountains. This refreshing three story lake front home is situated on a highly coveted gently sloping lot offering easy access to year-round water. This home makes it easy to enjoy the great outdoors with multiple outdoor spaces, full-covered dock, oversized patio, and outdoor kitchen. No expense was spared with vast floor to ceiling Pella transom windows, custom soft close solid wood cabinetry with convenient pull-outs throughout, double hung crown molding, natural wood beams, arched doorways and curved walls. The open plan flows beautifully for entertaining. 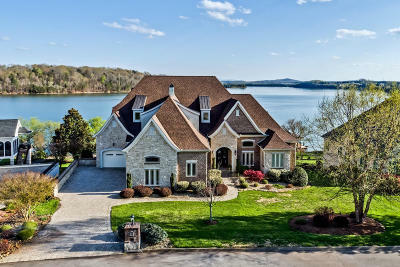 Relax in the living room with floor to ceiling windows overlooking Tellico Lake.